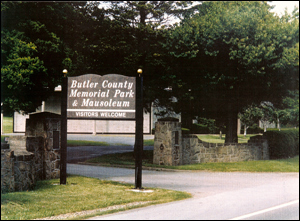 Butler County Memorial Park was established in 1939, and was created as an alternative to the traditional cemeteries that existed at that time. Butler County Memorial Park offers traditional ground burial as well as above-ground entombment in our heated and air conditioned mausoleum. Cremation is also available for both in-ground burial and mausoleum entombment. Because our cemetery uses flat, bronze memorials, our appearance is similar to a peaceful park, rather than a traditional, upright tombstone cemetery. Families prefer the 'park-like' landscape that we provide at the cemetery. The flat memorials also make it easier to maintain the beauty of our cemetery year-round. Our bronze memorials can also be highly customized through the use of color, photographs and wording. Most families like to make their cemetery arrangements ahead of time. Pre-planning gives people the peace of mind that insurance policies alone simply cannot provide. Our administration building is open Monday through Friday from 9:00 a.m. to 4:30 p.m. for the convenience of our customers. Our experienced staff is ready to assist you in making your plans ahead of time in order to minimize cost and stress, but they also are prepared to compassionately assist you in times of need. Appointments outside of normal business hours can also be made in order to accommodate your schedule if necessary. 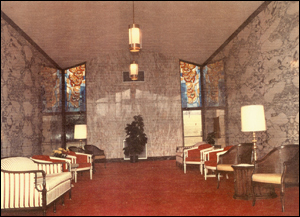 In 1973, ground was broken at our cemetery for the first Chapel Mausoleum serving Butler. Butler County Memorial Park has undergone four expansions and now has the most extensive and beautiful mausoleum in Butler. Featuring lighted glass front cremation niches and tons of Italian and domestic granite, our heated and air conditioned Chapel hosts many dozens of funeral services each year.